One of the many things I love about Canada is its obsession – and I don’t mean that in a bad way – about the British Monarchy. 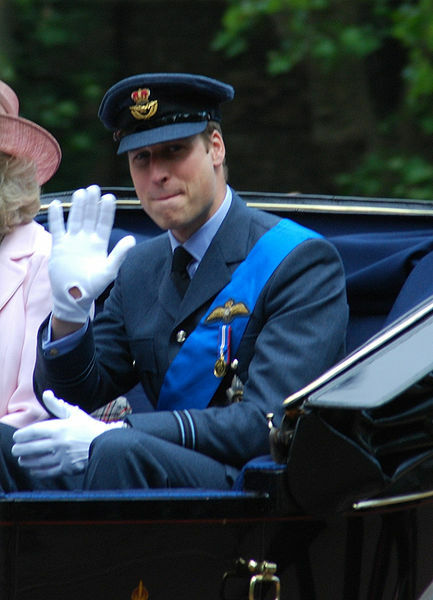 Witness today’s announcement of Prince William’s engagement to Kate Middleton… it was the top story on every hourly news broadcast on the radio, and naturally the lead story on The National. Peter Mansbridge couldn’t seem to get that goofy smirk off his face as he introduced one correspondent after another talking about, oh, I don’t know, every little thing they could think of to say about “the prince marrying the commoner” for the first fifteen minutes of the broadcast. It’s not like Americans aren’t obsessed too. (If you want to see a really snappy written piece from the U.S. about the whole situation, read this.) Sure, we loved Princess Diana just as much as the rest of the world. But Canadians have been into this stuff well before Lady Di came on the scene. Not hard to guess why… unlike my countrymen who fought some big ol’ war of independence against the Brits back in the late 18th century, the Canadians still have the Queen on their bills and get to play in the Commonwealth Games (which I’d never heard of before this year). The trip started out auspiciously. Our flight from Los Angeles to London had to make an emergency landing in Chicago because we lost an engine, so we sat around the charter flight terminal for what seemed like an eternity (it was probably just a few hours) and I perfected my backgammon skills. When we finally got to London the next morning, my 11-year-old brother managed to stay awake just long enough for a walk around Regent’s Park with the family before crashing out for the next 17 hours. 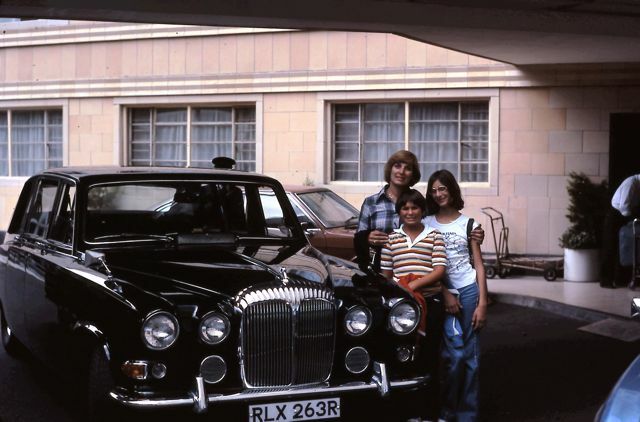 Not sure how my folks got away with leaving him in the hotel by himself while we three went out for dinner, but times were different then… still, I’m sure he was looked after (right, Mom and Dad?). Visiting England during the year of Queen Elizabeth’s Silver Jubilee (if you’re clever, you now know how old I am) was quite exciting. We visited Buckingham Palace and Westminster Abbey, and saw the Crown Jewels in the Tower of London. 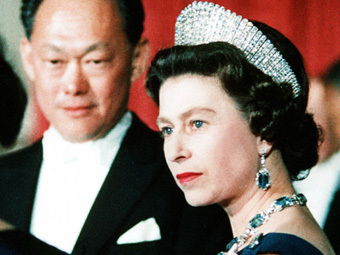 I thought that was a pretty weird place to show off the jewels, considering all the creepy stuff that had happened there over the centuries, but then again, I’ve never really understood British humour. 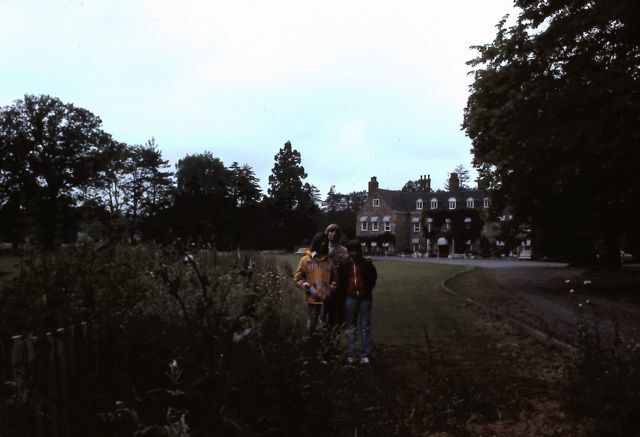 We traveled north to visit friends from L.A. who were living in Leicestershire at the time, and stayed in a haunted mansion in the middle of a meadow. (I’m sure it must have been haunted at some point.) There’s our “hotel” behind us. 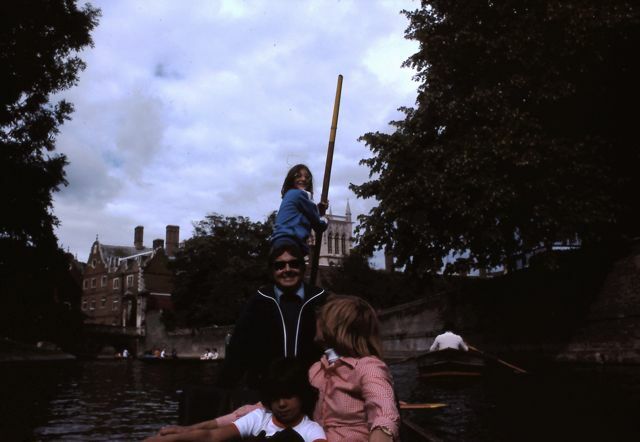 Here’s a picture of me at Cambridge, punting on the Thames. 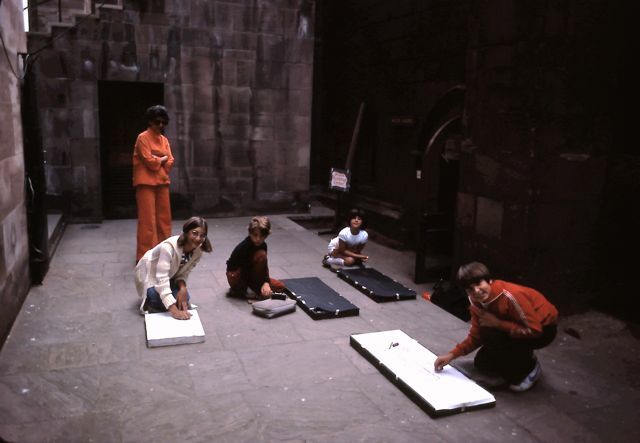 And here’s one of me and my brother and our family friends making stone rubbings in the bombed out church in Coventry – mine was of the Queen, and I proudly displayed my masterpiece in my bedroom for years afterward. When would I ever have seen anything like that on American television? Um, never. How much do I love Canada? So much. Thanks so much to my father, not only for taking these pictures (okay, all except for the first one, which is under Creative Commons, and that last one, which I stole from the CBC) , but for spending massive amounts of time earlier this year digitizing his massive slide collection covering my entire childhood. Way to go, Dad!